It is unfortunate, but even the trucking industry is victimized by thieves from time to time. The key to protecting yourself is to make it as difficult as possible for criminals to do what they do. We have you covered with a selection of cab and trailer securement supplies including heavy-duty cargo door locks for dry goods vans, landing gear locks, and wheel-to-pedal locks for inside the cab. Why invest in cab and trailer securement equipment? First is the obvious protection of your cargo and equipment against monetary loss. Equally important is the reality that protecting the cargo you carry is an important part of your job. Finally, you could save on your cargo insurance by demonstrating that you take the extra steps necessary to protect it. 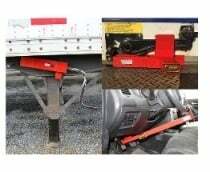 Investing in cab and trailer securement equipment will pay for itself by preventing losses at the hands of criminals. You cannot afford to not have it. Heavy Duty Rolling Door Key Lock 5" x 5" x 8"